Troy Alves may not be the biggest guy on stage, but his mega-ripped, perfectly symmetrical back is one of the best in bodybuilding history. Want to know how he built it? Here's his workout! The bodybuilding stage is home to giants like four-time Mr. Olympia Jay Cutler and two-time Arnold Classic Champ Kai Greene. But the world of bodybuilding also boasts men like Troy Alves, who has the symmetry and size reminiscent of the Arnold days. Troy's Frank Zane-like body appeals both to old-school fans who appreciate that classic physique and people who love watching mass monsters prowl the stage. Alves's symmetry isn't his only strength. He's also the owner of an incredible back. Over the years, his rear double biceps pose has been noted by some experts among the best in bodybuilding history. His back has been a big part of his competitive success since 2002 when he qualified to be a pro at the NPC USA Championships. He'll continue to use his great pose and enormous back at this year's Master's Olympia. Although his shredded lats and lower traps are paramount to his stage performance, the 45-year-old-grandfather knows he can't just rely on them to look great on their own—his back still requires focus and work. Want to give his workout a try? We dare you. "Nothing beats pull-ups for getting wider. To maximize the effect, I do a 1- or 2-second negative and then explode up." "I like the Smith Machine for these. To me, it's safer than using free weights, because I can use more weight with less strain on my back, leading to intense contractions. I start with one plate per side, then go up to two, three, four, and then throw five plates on for the last two sets." "Either move is good for back thickness. By alternating moves, I hit those muscles from different angles." "I make sure I come down right under my chin and flare the elbows out so I can hit the rhomboids and traps. After a couple seconds of negative, I pull as hard as I can and squeeze hard before letting the handle rise back up." "I use a rope on a cable pulley and squeeze it into my waist and keep my shoulders back. As I go back, I can feel a good contraction with this movement. 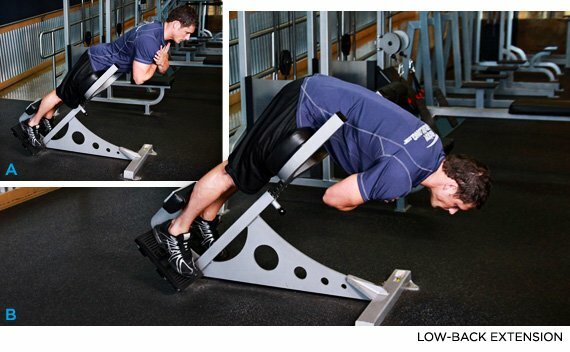 I finish up with this exercise because it's great for that lower-back Christmas tree look." 3 sets of 10-15 reps Attach a rope to a low pulley. Pull rope to waist and keep shoulders back.